I’ve got around to editing-ish, the blog for the Italy trip. It’s mammoth I’m afraid. I’ve not quite worked out how to best put it up so you’re just going to get all of it and then I might see about turning some bits into actual pages. So, are you sitting comfortably? Myself and Lee stayed in il Casale di Mario (http://www.ilcasaledimario.com/ilcasaledimario.aspx) – an agriturismo (an agriturismo, for people that haven’t come across them yet, are places to stay out in the countryside often on a “working farm” of some sorts) on the outskirts of a little village in the Umbrian hills called Montecchio about an hour and a half drive from Rome. We booked it a couple of months back – I was enticed by one of the cheap deal websites (KGB). We left home at stupid o’clock on Thursday morning to head to Gatwick. As an aside, Gatwick have added massively to the number of bag scanners so they can process people a lot quicker. And then, these masses of people they’ve now processed are squeezed through the World Duty Free shop which is more of a hold up than the scanners ever were! We got to Fiumicino airport in Rome at about 8am and picked up our hire car. It was incredibly hot – 37 degrees and wonderfully sunny. So far so good. Until we actually tried to locate our agriturismo! 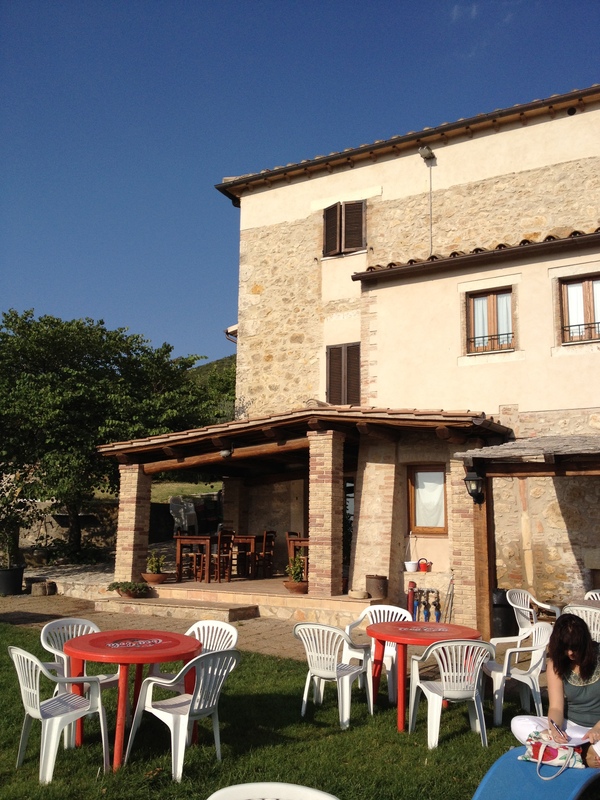 The address on the voucher takes you to a little terrace house in the middle of Montecchio village. Not quite the spacious detached villa type that we’d seen on the website – hardly an “agriturismo” – they had just about enough space for a pot plant outside of the front door. We’d arrived at “siesta” time – the door was wide open, but there was no sign of anyone. Just at the point where I was about to wander in, Lee suggested we continue looking for a sign (an actual sign, not a godly sign. I assume anyway). Still not finding anything, Lee checked the address on the actual website on his phone, which it emerged was actually 5 minutes down the road by car. Off we went and, despite a very odd numbering system, we eventually found the place. And it was lovely! The house looked reasonably sized on the outside but felt positively vast on the inside with a couple of dining areas complete with humungous fireplace, an industrial looking kitchen and I think 5 guest rooms over the top two floors. Our room was large, with some dark wooden sturdy furniture, a couple of chairs, the proper double bed (rather than these hotels that seem to like to push two singles together and which gradually come apart during the night) and a couple of windows overlooking some spectacular scenery. 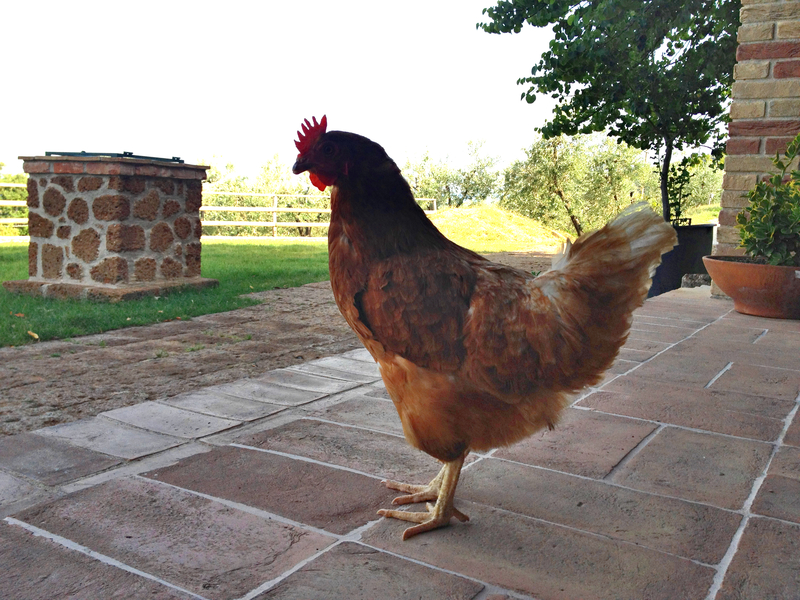 The house has an olive grove and a sort of terraced garden overlooking it where a chicken casually pecks around the tables and chairs that are there. On a couple of the evenings, the landlady lit fires there – it was positively roasting the entire duration of our stay so it couldn’t have been for heat. It was a very fragrant fire, so I thought perhaps the Italian version of incense or scented candles but then the last time, we saw that she’d been cooking something in there. Very authentic! The place was very quiet, just the soundtrack of crickets and chimes tinkling somewhere in the light breeze. I like Il Casale di Mario a lot. Our landlady was very sweet – she didn’t speak any English and I think was just generally pleased that we’d made an effort to speak Italian, albeit, not obviously as fluent as it could be! It was a good opportunity to practice. In fact, when we got there, I must have given such a good impression of being Italian, that she seemed genuinely miffed when I asked her to repeat what I imagine must have been a really simple question! Usually when we’ve been to places in Italy, my attempts at Italian are instantly responded to in perfect English, nice of them but frustrating. Her husband was amusing – a real grump. The only time he said something to me, I didn’t hear it properly and asked him to repeat it, to which he then responded with “inglese?” in a very scornful tone and then on my reply “si, ma mio italiano e non c’e bene” – yes, but my Italian isn’t that good – he promptly frowned, turned on his heel and left without saying anything else! From then on, we didn’t even get a hello! When we arrived here, eager to test my Italian, I asked such questions as “what time is breakfast?” “Is it included in the price?” (it should have been – but you never know with these deal websites), “What time is dinner”, “We get one free don’t we?”. I was molto impressed with my fluency. Alas, she didn’t understand what I was saying ;-). With all three of us thoroughly baffled by the entire conversation, we resolved that we should probably just get dinner out. So off in search of food we went, heading to a little village called Todi (or Hot Todi as we came to call it. It was indeed hot after all), a very picturesque hill top town about 25 minutes drive from Montecchio. After ignoring TomTom’s advice about turning into fenced off fields and up footpaths, we found a small supermarket and purchased a few bits and pieces for a picnic – something called Lingue Croccanti alle olive (which is a thin, crispy, buttery and delicious bread which sadly hasn’t made it over here yet), cheese, grilled peppers, tomatoes and a large tub of mint choc chip ice-cream. Resolving to go back to Todi to actually look around, but being far too hungry to do it there and then (besides, there was a steadily melting large tub of ice-cream to deal with), we decided to head back and find somewhere to sit and eat. Heading back to Montecchio, we spotted a sign for a viewpoint – great! Viewpoints always come with places to sit eh? So in our little hire car, we trundled up a road that was something more suited to tractors, or possibly tanks, than hire cars. Lee was beside himself with terror about what the car would look like by the time we got to the top, which never seemed to come. Every bump incurred a gasp and sign from Lee. He felt that car’s pain every step of the way. On the way up we glimpsed a spectacular view through the trees. Montecchio itself is very pretty, perched atop a hill and surrounded by those tall thin evergreens you only seem to get in Mediterranean countries. 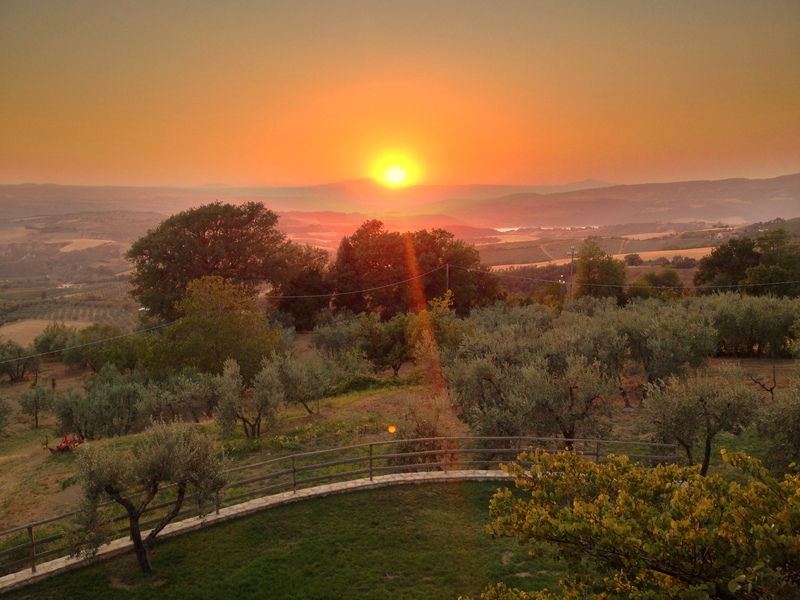 There are larger hills around covered in dense forest, there’s field after field of vineyards and olive groves with trees dotted along the landscape in lines with their silvery grey/green leaves and gnarled ancient looking trunks. The whole countryside is bathed in a bright sunshine but as though it’s beating down through a soft focus filter. So that was the vista we were looking forward to at the top, and these enticing snippets of scenery drove us on (not to mention the impossibility of doing a 3 point turn or reversing all the way down). And then we got to the top. Well let me tell you. The top was a glade of trees, sectioned off from anywhere approaching a viewpoint. There was no view at all! Pah! Still, it was nice enough and it was too traumatic to go down immediately, so we had our picnic amongst the trees and instead of the panorama, we watched some very diligent ants move leaves more than 20 times their size from one tree to the next. We ate. A lot. And we almost made it through our giant tub of now melted ice-cream. Pleasantly full, we headed back to our Casale for a relaxing evening drinking our carton of wine (yes, a carton – a bargain at €1 and lovely! It’s like Ribena with a kick. I should write wine labels) and trying to figure out what the Italians on TV were talking about. Lounging on the bed, completely stuffed from our picnic, there’s a knock on the door. It’s our landlady. And… and…. <insert drum roll here> She tells us that dinner is ready! Nooo! After a terse “what on earth do we do now? !” conversation once she’d gone downstairs again, we followed her down and set next to another couple who were from Manchester (KGB deals again! ), and we had our second dinner of the evening. And let me tell you, the Italians don’t scrimp on dinner – it was 4 courses. I have never been as full as that evening. I hadn’t even had a chance to tell her that I was a vegetarian! I broke the news to her when she bought us out some wine. She seemed thoroughly puzzled. Obviously if I’d have known that she was cooking us dinner, or that it wasn’t a selecting from a menu affair, I would have mentioned it earlier – I felt awful! The anti pasti dish came out first – some bread with some kind of truffle paste on (the Umbrian’s are big on truffles), some melon, some cold meats (for Lee – it was a sharing platter), followed by a massive bowl of pasta each, then pork and salad (I had salad) and then a sort of melon peachy desert with cream. We had a lovely evening in the end. The couple from Manchester were chatty and gave us some advice (good), and some of their wine (really good). 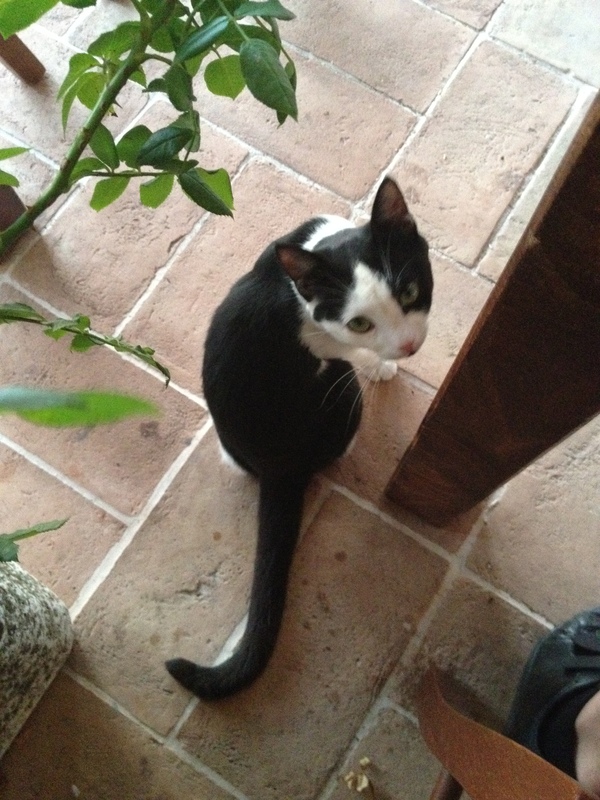 And we had 3 gorgeous little kittens for company when our landlady wasn’t half-heartedly shoo-ing them away. The two tiny ones loitered outside the open doorway opening out onto the terrace, looking hungry but too scared to come in. The slightly older one was really friendly and spent dinner cosying up to our legs in an attempt to get some food (I wont kid myself!). He was my favourite and I think the landlady’s too (she called him Oriest, or at least now I do – though it doesn’t appear to be a valid name on further reflection/search on baby name sites). Oriest was my saving grace, he ate more of my pasta than I did. I kept furtively hurling out bits of pasta through the door when the landlady wasn’t looking. Oriest would go and eat it and then come back for more. I needn’t have been quite so sneaky about it. When she came back, she looked a bit offended that I hadn’t been able to finish it all but she took the plate outside and gave the rest to the kittens! After all I’ve heard about how the Italian’s treat their animals I was touched. And let me tell you – kittens adore zucchini pasta. The woman from the table next to us didn’t eat pork (because the story goes, she saw a pig when she was younger rolling around in mud. Hmm) and when the meat course came out, wouldn’t you know, it was pork. She was horrified at seeming rude and couldn’t leave it untouched. I suggested my kitten distribution technique but she wasn’t up for it. She ended up wrapping it in a napkin and taking it upstairs. When the landlady came back to collect the plates, she was very impressed by her clear plate (bone and all), and offered her more. I haven’t laughed that much in a long time. I must have drunk about a litre of wine by the end of the evening and I was amazed at my lack of hangover of any sort the following day, particularly given my usual light-weight status. I think that must mean that the wine is good (or is perhaps just Ribena). It did however, mean that I spent much of the night awake listening to church bells in the distance go off every 15 minutes. And throughout the full 5 days, I still wasn’t able to establish a pattern as to the number of bell tolls in relation to the time. On the drive through the winding mountainous roads towards Todi, there were discreet little lay bys and in a couple of them were women dressed up to the nines. When we went past the first one, Lee claimed she was a prostitute. I thought that she was on her way to a party when her car had broken down and that she was simply trying to flag down cars with a view to getting a lift back to town. Then we went past another girl who appeared to be in the same unfortunate predicament. This one appeared to have someone with her. I don’t think they were discussing where she would like to be dropped off. I conceded that Lee might be right (there’s got to be a first for everything I suppose). I’ve been worried for these girls ever since. Do they have murderers in Italy?! It doesn’t seem at all safe. And curiously what pops up in my thoughts most is “where do they shower?” It’s been so hot that you sweat even with the air conditioning on full in the car, and you’d get all icky from the men, wouldn’t you? So, in the interests of giving advice on life in Italy – men, if you’re going to go, get up at the crack of dawn and go to these girls first thing. Breakfast in the mornings was nice. Coffee, little crisp squares of French toast with home-made apricot jam (made from the produce of the tree about 5 metres away), yoghurt, some home-made lemon/orange cake and then some kind of tart. On the last day, she even brought out a panacotta dessert for us. I assume this is traditional Italian breakfast fare. Unless they assume it’s traditional British breakfast fare. Perhaps it’s all a total misunderstanding and we both cultures just eat cereal for breakfast. Either way, anywhere that serves cake at any time of the day is ok by me. From the first day, Lee had been nursing a number of mosquito bites. They affect him quite badly – not only does he often get lots but they’re large, swollen, sore looking things that itch incessantly and stay red for weeks. I’ve told him to look on the plus side. Whilst he’s around, I don’t get any. On another dinner quest one evening, we headed into Montecchio at about 7pm. In London, youths form gangs and stand outside of shops being noisy and threatening looking whilst the adults remain inside watching TV. In Montecchio, and perhaps a lot of Italian villages, it’s reversed – it’s the old folk that form gangs and loiter on the street, looking threatening. They hang out at bus stops when I’m pretty sure the busses have stopped running for the day. They hang out in town squares, next to cathedrals, in bars (ok, that one isn’t quite so unusual). The locals take their chairs and plonk themselves down in presumably the only outside space they have – the road – which is only marginally wider than a car, so household after household line their chairs with their backs to the wall facing the road in order to let any traffic past. As we’d walk past, the conversation would stop and their gaze would follow us until we were out of sight. Either this is a demonstration of how wonderfully sociable the Italian’s are amongst themselves or a demonstration of how dire Italian TV is that in order to entertain themselves they need to sit in the roads staring at tourists. Our criteria was to basically find any restaurant at all that didn’t look threatening. There were 4 restaurants in Montecchio, alas, none met our criteria. The chefs sat outside, sparsely dressed and sweaty looking, glaring at people who walked past. Hungry now, we decided to head to Todi again (no sign of prostitutes this time, I hoped they were at home having a hot, disinfecting bath). We got there at about 8pm. Todi was a ghost town! The main piazza was lovely; very large and there were restaurants around but there was nobody in them. And still the chefs glared. By then, we’d decided we’d have to relax our criteria and just go anywhere with food. I mean, deep down, they must want to make money? Perhaps they don’t realise that glaring at people walking past scares people off. Perhaps that’s actually the hard sell for Italians. We headed to the doorway of a pizzeria – randomly selected by Lee. You couldn’t see inside – it was a nerve racking moment. The waiter suggested we walk to the garden terrace where upon there were HORDES of people – Italians and tourists alike. The terrace was beautiful – tables under a large wooden lattice type structure covered in flowers and it had an amazing view of the surrounding countryside. Success! The pizza’s were fabulous – large, thin, crispy and the house wine was beautifully fizzy (legitimately – it was frizzante). So my recommendation to anyone that goes to Todi wanting dinner is to head to Pizzeria Cavour. It only cost us €24 for both of us. And let me tell you. The Italians, eat more food that I imagined was ever possible. They had these antipasti dishes, which I had always thought was basically a starter but the plates are massive and simply couldn’t have been – they were twice the size of plates we have in the UK and it was piled high with food. We decided that in these parts antipasti must be a meal in its own right. The couple next to us had one of these each, and also had a large salad with it which did seem a bit excessive but each to their own. Half an hour later, having cleared their plates, their waitress brings out a giant pizza each too. The Italians or at least, the young ones, are all tiny and toned, WHERE DO THEY PUT IT ALL?! Driving through Umbria, we’ve seen a few places that look particularly impressive. There are field after field of sunflowers and in the midst of the fields on a hill, will be an old stone castle, newly renovated, with a long drive lined and tall thin ever green trees leading up to it. Jealous, jealous, jealous. I was pleasantly surprised by the amount of cats and dogs everywhere we’d been. A lot of houses seem to have cats curled up looking adorable outside and the landlady where we were was really nice to the ones there. I had a bit of a bonding session with the dog which could really do with a wash and a brush. Anyway, I think that my cattery/kennels idea (see The Grand Plan) is still on basically – I think there’s a need for it. At night you could hear the barking of lots of dogs – I don’t think as a general rule the Italian’s let them in their houses. It reminds me of the Tim Park book I just read – it would definitely be annoying if you lived next door to that but as it was, it was quite far off in the distance and really only detectable at night so the distant barking only added to the atmosphere rather than being genuinely annoying. 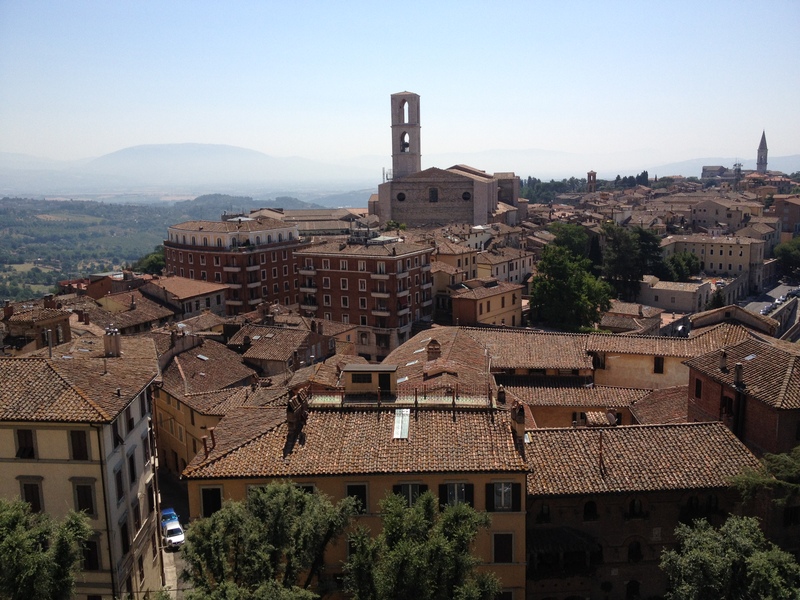 Our first trip of the holiday was Perugia (of Meredith Kercher and Foxy Knoxy fame). It was about an hour or so from Montecchio. 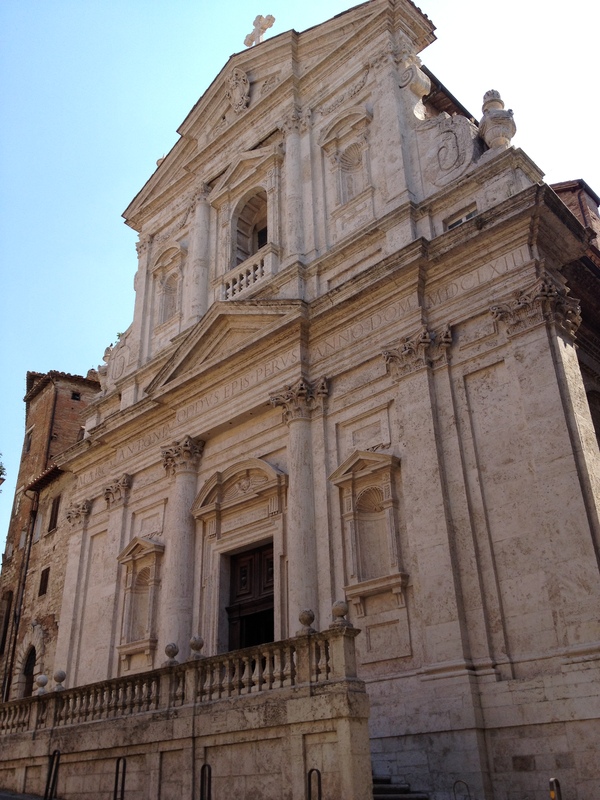 Perugia seems to be a good area for language schools. Alas, I’m afraid I found it quite disappointing. It wasn’t as pretty as some of the hill top villages we’d driven past, the architecture didn’t seem quite as spectacular and the buildings were a bit more run down. The shopping area contained I think only one affordable shop, and the rest were expensive lingerie shops (which in fact featured in every location we went to – the Italians must be kitted out in the most glorious lacy numbers), expensive clothes shops, expensive makeup shops… do you see where I’m heading? It was a lot smaller than I’d imagined as well. There was quite a cool (literally), underground tunnel thing going on – if you park at the bottom of the hill, there’s a series of escalators that take you to the top with the final one coming out underground in what looks a bit like the Mines of Moria from Lord of the Rings – large caverns with other large cavern off-shoots. Very interesting and I think my favourite bit of Perugia. I’ll have to research the history of those. On our general tour around the area the following day, we visited Orvieto and Bolsena. Orvieto is lovely. It’s quite a large village and again, on top of a hill where the houses seem to grow out of the rocks beneath them. The village has a surely unnecessarily huge cathedral (il duomo) – the inhabitants of the entire village could fit in twice over I’m certain. 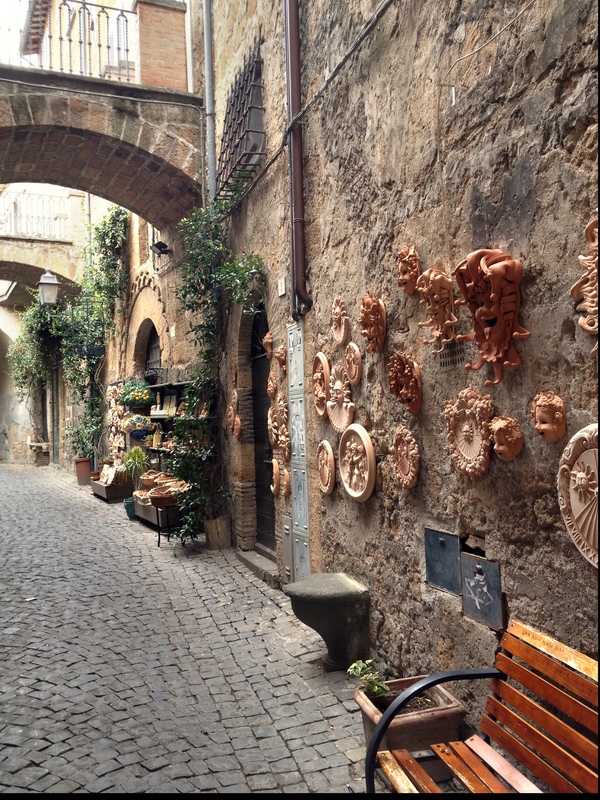 The shops around the cathedral sell pottery – terracotta ornaments that you can put outside the house on the walls and glazed plates that you’d put inside. There were a couple of olive wood shops selling anything and everything made out of the very smooth, multi-coloured olive wood. Very nice. I’m often disappointed that I’m not the kind of person that has a house full of nick-knacks and memorabilia. The rest of the shops sold expensive lingerie again, expensive ornaments or were giving the locals expensive haircuts. The shops were mostly empty. It’s pretty much the height of tourist season. I’m not sure how they make a living. Perhaps that’s why things are so expensive. Perhaps they only need to sell a couple of things in a day to make ends meet. Having said that, if all their shops are so expensive, then how on earth can they afford anything? They must have to get a mortgage out just for their lingerie alone. I do like the shops in general though. They’re generally tiny and in England, or anywhere else, I’d be uncomfortable going in because of the often in your face pressure to buy something. In Italy though, they simply wish you a good day and leave you to get on with it, resulting in my going in a lot more shops than I would have otherwise. Though I’ve decided that seeming non bothered-ness about whether you buy something or not could probably be reigned in for the restaurants where such is the lack of pressure, you’re not actually sure if they’re open or not. After wandering around in Orvieto we resolved it would be a good place to come back to for dinner. And then we headed out to Bolsena where apparently the lake has healing powers. By the time we got there, it was all shut up for siesta so we wandered around for a bit looking mournfully in shop windows (or at least, I did. I suspect Lee’s look was one of glee). It looked pretty. We had our lunch overlooking the very pretty lake. In general, I had a good vibe about Bolsena, it’s just a shame everything was shut! Terni is average. Compared with the other places we’ve seen, it wasn’t particularly pretty and the buildings were unkempt. We resolved to find the cathedral and some green space before making up our minds. We found them and then promptly made up our minds. Terni on the surface of it, does not appear to be all that. Though it did have perhaps one of the best supermarkets I’ve ever been to. The lemons were the size of melons. The melons where the size of footballs. The footballs…. well…. I was struck again at how expensive things were. Lee finally succeeded in passing me his cold and I spent €13 on 20 paracetamol and a nasal spray rather than, say £5 here. Some things are cheap. Alcohol being one of those things; so much so we bought some cartons of wine to take home, some Prosecco and some grappa. They had a wonderful array of cheap unhealthy pastries and biscuits – croissants filled with chocolate, apricot jam and anything else tasty sounding. When I move here, rather than being self sufficient and having my own business, I think I should seriously consider starring in documentaries such as: The woman whose stomach is made of cake. We went onto Narni next because it was mentioned in the things to do on our agriturismo’s website. Twenty minutes later we arrived at the “town centre” according to TomTom but it was just somebody’s house. I suspect if we had been less hot and bothered by that point, we could have got out of the car and found an actual town centre but instead we decided to drive back. Our supermarket visit cleared up a matter of confusion for us. I don’t want to be too personal but we’d run out of toilet paper on the 3rd day and our landlady hadn’t given us any more. I have visions of her thinking we English are excessive with our toilet paper. Well. I can’t blame her. I used almost an entire roll in an attempt to mop up the remains of our tub of melted ice cream from the first day, which I had knocked over in a dazed state in the middle of the night. Just what you need at 3am. Well I hadn’t realised how expensive it was until the supermarket visit. €5 for a pack of 4! Pah! No wonder! Anyway it forced us to be truly continental and experiment with the bidet which I have to say, are not as disgusting and creepy as they look. Of course, we had to google to find out how to use the thing but after that, well, it wasn’t so bad. Italians are psychotic when it comes to driving. I know this, yet it never fails to shock me. 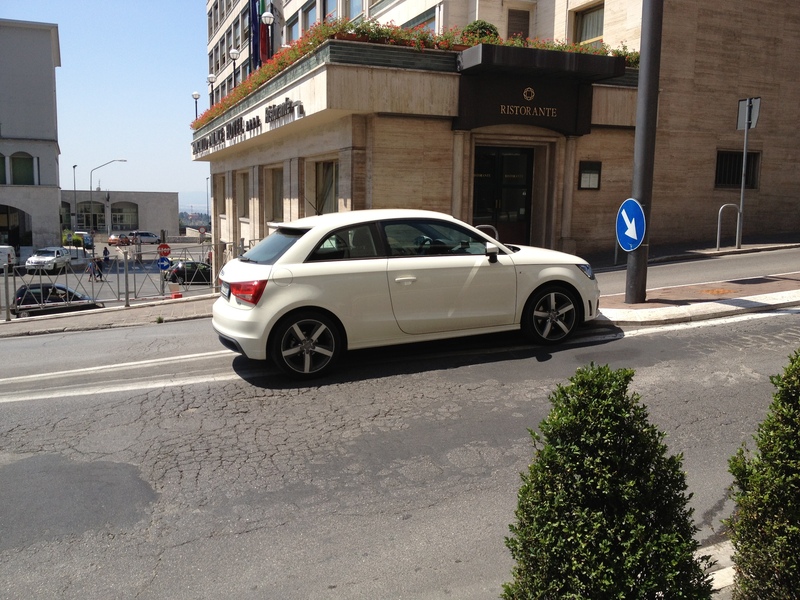 Italians – do you realise your nation drive like maniacs? This person parked in the middle of the road. The middle. There were actual parking spaces moments away. But no, no, best to park in the MIDDLE of a road. Swerving this way and that; the lines on the road don’t give them an indication of where to stay between, but where to drive along. And even then, they still swerve erratically. All of them take racing lines around corners, regardless of whether it’s impossible to see if something’s coming in the other direction or worse, even when they can see there’s something coming. Having said that, we only had one near death experience so we weren’t doing too badly. There. I think that about sums up the trip. I’ve got photo’s – I’m going to work out a way of showing them! Meanwhile, sogni d’oro!